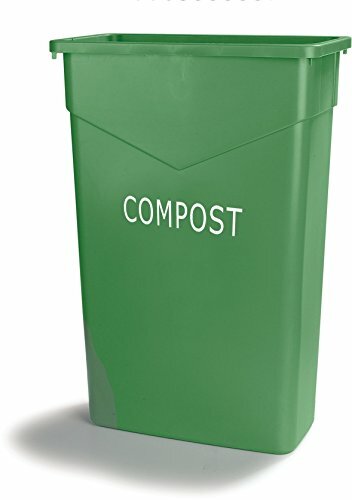 Carlisle TrimLine compost container design fits neatly beside work tables or in narrow spaces. Corner tabs help keep trash bags secure, bottom helper handle makes lifting and dumping easier. Optional swing lid conceals trash while providing easy touch-free access. Flat lid also available for transport and to control odors. Wire Dolly fits on either narrow or wide side of can, 100 pounds weight capacity. Green color. Measures 10.95-inches length by 20.03-inches width by 24-3/4-inches height. Made in USA.